BCAgility: So you can’t read a course map without your glasses anymore? Stewie JRT an agility blog: We’re not getting older, we’re getting better! The Blue Hound Beagles at WordPlay: Stop the Timer! The Aging Agility Dog…or Not? Flying Poodles: Teaching dogs, teaching people: getting older, getting wiser…. AgilityNerd: Aging in Agility – Choosing Retirement? Secret’s Journey: Time moves on…. And our partners get older. Life and Times of Team Whisner: What? How did this happen? All Star Agility: Aged to Perfection! 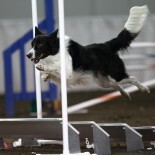 Bad Dog Agility: When do Agility Dogs Peak? Spot On K9 Sports: Is 10 Too Old to ADCH? AgilityNovice: Life Is Short…Play With Your Dog! Peakdogs: Aging…being young at heart! Pingback: WordPlay » Blog Archive » Stop the Timer! The Aging Agility Dog…or Not?